hülsta solid. | hülsta - Design furniture Made in Germany. Live naturally: solid stands for genuine materials and timeless design. Our premium furniture series covers all living areas and gives them a classic crafted character. Simplistic shapes, a clear focus on the mix of materials as well as a practical design with special details turn solid units into your favourite pieces. Experience a creative solid wood range that has been developed to inspire – for an entire life. The solid system range proves that functionality and design do not contradict each other. Stylish shelving walls become practical room dividers. Supported on legs, the shelving systems combine outstanding stability with elegant design. The most beautiful things that you can make out of wood. A special design is characteristic of our carcase units: like a delicate leaf, the fronts cling onto the carcase and slightly protrude all-round. Tapered outwardly, the fronts are elegant design features that double up as practical handles. 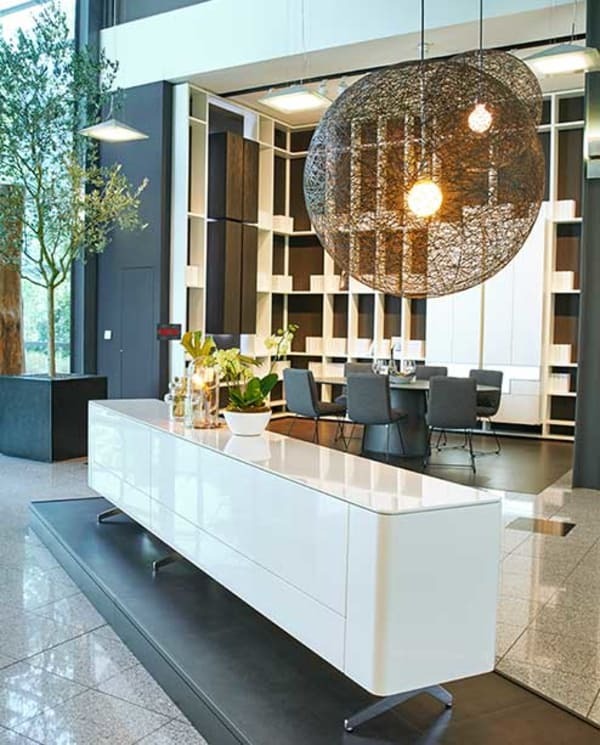 Only the most precious and natural materials such as solid wood from sustainable sources, steel, glass, ceramic, wool and natural leather are used to manufacture solid furniture. Innovative features: traditionally crafted joints revisited, bending and shaping to suit the respective materials, hard-wearing surfaces, state-of-the-art technology and high resistance to daily wear and tear guarantee maximum longevity. The expressive furniture units from the solid series also make a great impression. Harmonious lines meet a perfectly balanced mix of materials and a tradition-conscious craftsmanship know-how. Welcome to the new dining culture: bench, chairs and the two tables in the Dining range turn eating into an unforgettable dining experience. Turn the most comfortable space in the world into the most beautiful space in the world. The solid Sleeping line is based on the characteristic frame design, which is always finished off with a slim elegant leg frame. This design is repeated in the bed, bed bench, night tables and all chests. 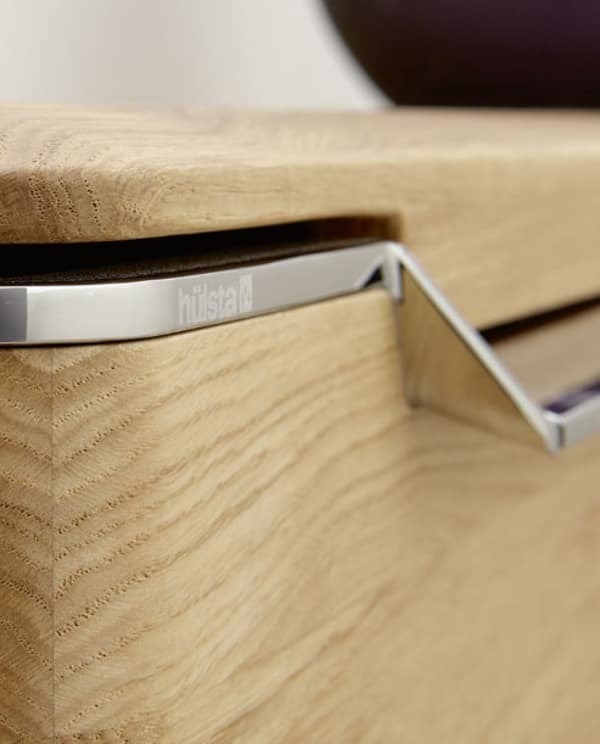 All handles are beautifully integrated flush into the fronts. Our commitment to high-quality workmanship is also reflected in the classic upholstery quilting of the headboard. solid Sleeping combines excellent workmanship with modern design. All handles are beautifully integrated flush into the fronts. Our commitment to high-quality workmanship is also reflected in the classic upholstery quilting of the headboard. The wardrobes of the Sleeping line offer matt glass fronts that create a striking contrast to the solid wood furniture in frame design. Open shelving units ensure a smooth transition to the dominant wood scheme. What should be your first impression? Good and certainly solid. For your guests, for yourself, forever – with the timeless units from our Welcoming category. For the hallway, we use the carcase unit system – including the elegantly tapered fronts, which are also repeated as a special design feature on the mirror and wall-mounted coat rack. As part of the Welcoming concept, steel is used for the fixings and functional components of the units. The mirror and wall-mounted coat rack are subtly lit from the rear, giving the impression of them not being attached to the wall – an elegant and sophisticated interior design style.